I got a copy of my Digital Photographer Philippines issue number 41 almost 2 weeks ago. This new issue includes a lot of tips and techniques regarding photojournalism. DPP's issue 41 talks a lot of some topics if you are into the journalistic side of photography. There's the 11-page guide in-depth feature about photojournalism with some insights from Asian Center for Journalism at the Ateneo de Manila University. There are also guides on how to make documentary photography from Baguio-based photographer Tommy Hafalla. There are also some stories from professional photojournalist Carsten Stormer, as he shares his experiences in war fronts and the effects it brings. If you're planning to shoot in Intramuros, there's a travel feature about it. Have I mentioned that they also included in this issue a press release from Department of Tourism about the controversial No Shoot Policy, so there won't be any problem should you choose to shoot in the walled city. Lito Sy also shares some tips in the Masterclass section about using only one light. There are also 20 tips to help improve your portrait photographs. One article I really liked to read is the section about how lenses work. It contains an in-depth explanation about the anatomy of lens and which lens is the right one for a photographer. 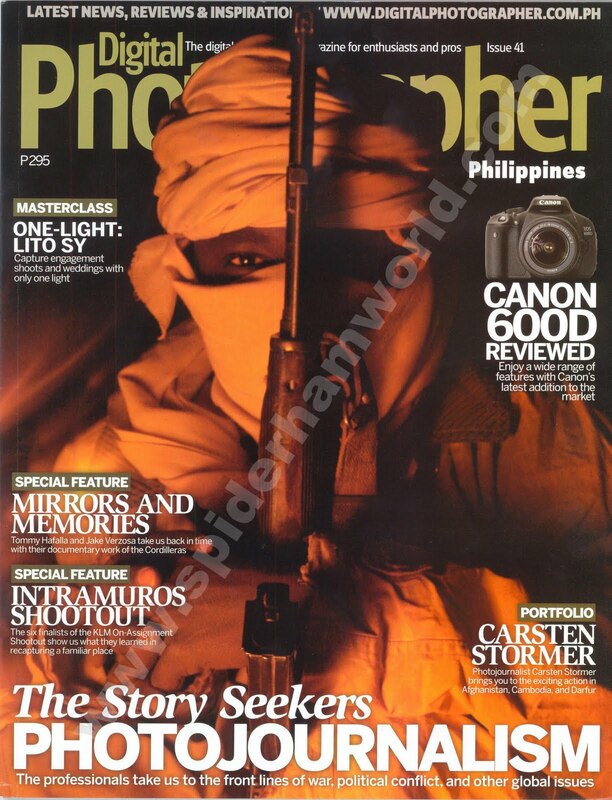 Digital Photographer Philippines number 41 is now available at your magazine stands and some book stores.